William H. Clark, cashier of the Bank of Watertown; came to Milwaukee in 1852, and to Watertown in 1854. He organized the bank that year and has been connected with it ever since; Mr. Clark organized the gas company here, in connection with A. L. Pritchard, and conducted the works for several years. He has been in the banking business continuously since August 4, 1854, over a quarter of a century. Mr. Clark is a native of Chemung Co., N.Y. If there has been any one question more than another that has given rise to fierce discussion in the Common Council, it is that as to what disposition should be made to the bills in favor of the Gas Company for the gas burned in our street lamps. Some of the aldermen take the ground that each ward should pay out of its own fund for the gas consumed in its limits, and that the same should not be made a charge upon the city general fund. We believe this is the way the matter stands now and that the 1st, 2d, 3d and 4th wards, being the only ones in which there are any lamps, now pay for the lighting of the streets. We consider this unfair and unequal. We do not know why the 5th, 6th and 7th wards should be absolved from their part of this expense, though there are no lamps located within their limits, any more than they should be for any other outlay for the benefit of the city at large. Why could they not, with the same propriety, have been relieved from the payment of their just proportion of the cost of building the Main Street bridge? Or why not exonerated from their share of the expense of repairing the Plank Road bridge near the Rough and Ready Mill? The question before this community is whether we are going to have gas or go without. The Gas Company finds that at the present rate they will have to stop manufacturing, the increased price of coal having added materially to their expenses. Last week the gas consumers held a meeting for the purpose of ascertaining what measures could be adopted to continue the supply. They are willing to pay as high as five dollars per 1,000 feet and if the amount taken could be sufficiently increased to make it safe to the company to go on, we presume there would be no difficulty in keeping the works in operation, but nobody can ask the company to run them merely for the fun of the thing – and lose money too. As far as we have heard any expression on the subject, we think it is safe to assume that a large majority of our citizens are decidedly in favor of having our streets again lit up during the evening. Of course, there are some evenings when this would not be necessary, but most of the time the nights are dark, and then lighted streets are a great convenience to all who have occasion to go out. As the benefit is public and general, the compensations ought to be paid out of the general fund. Those who have been to the trouble and expense of putting in fixtures are unwilling to change them and resort once more to the old methods, and besides this, the use of lamps would have the effect of raising the rates of insurance, which would be a considerable item to a city like this. 10 01 GAS LINE ON WEST MAIN ST.
Common Council Proceedings: Resolved that the Watertown City Gas Company be requested to continue the laying of their gas pipe on West Avenue Street [West Main St] to the track of the Chicago and NorthWestern Railroad, and that lamps be located at such points as the Mayor may direct, the laying of said pipes to be at the expense of said Gas Company. Common Council: The President stated that this meeting was called for the purpose of considering what aid could be extended to the Gas Company by this city to enable the company to run the works . . .
Joseph Terbrueggan, W. J. Toussaint and L. H. Cordes established the Watertown Electric Light plant; disposed of in 1906 to the John I. Beggs interests. In 1889 Joseph Terbrueggen was one of a company of three who put in the electric lighting system in the city and the company later disposed of the plant. Mr. Cordes became greatly interested in electric lighting, a subject which he studied with great enthusiasm. 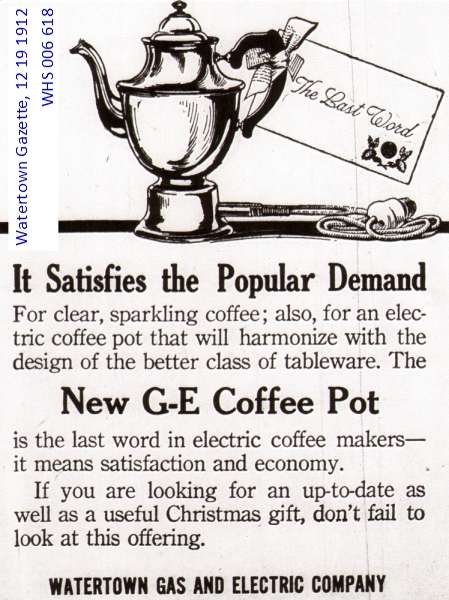 Coming to the belief that Watertown could support a plant, the partners secured a franchise from the city of Watertown on May 27, 1889, and at once proceeded to install. Business men and the public generally know little about electric lighting systems and rather doubted its success in a town of this size. However, they did not allow themselves to become discouraged and went to work to secure contracts from business men and others. The city contracted for twenty street lights, and a number of business men agreed to take a few lights, the late Joseph Salick, the jeweler, being the first to commend the lights and signing a contract for a substantial number of lights. Most of the business men were indifferent but became convinced of its feasibility as soon as a few were put in use. 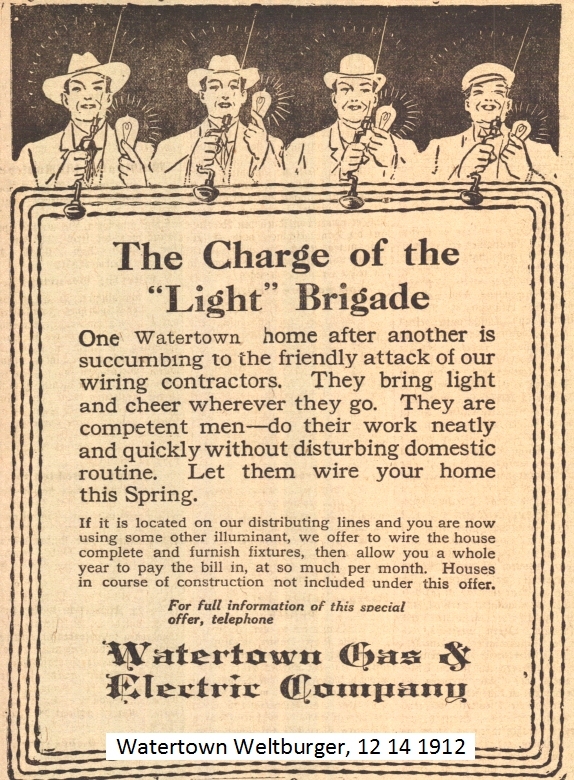 12 18 GAS LIGHTS TO SUPPLIMENT ELECTRIC? Complying with provision made by the common council, the Watertown Gas Company is engaged in recalking joints and making other necessary repairs to the gas main which lies in Main Street. This main was laid forty years ago and is found to be in very good condition, experience showing that cast iron does not wear out in the ground. In refilling the trench the company workmen are performing excellent service and setting an example worthy of emulation by persons similarly employed. The earth is so perfectly tamped that an almost even surface is left over the trench. This very desirable condition would seem to refute the contention often made here that the same amount of earth taken from a trench cannot be replaced without leaving a clumsy and unsightly ridge. The plan pursued by the Gas Company entails the service of three tampers to one filler. The Watertown Gas Company is laying new gas mains in several portions of the city. On North Washington Street seven hundred feet of three-inch pipe is being laid and in College Avenue from Milwaukee Street to Main Street is being supplied with two-inch pipe. An arm of the College Avenue main will be extended west one block in Market Street. 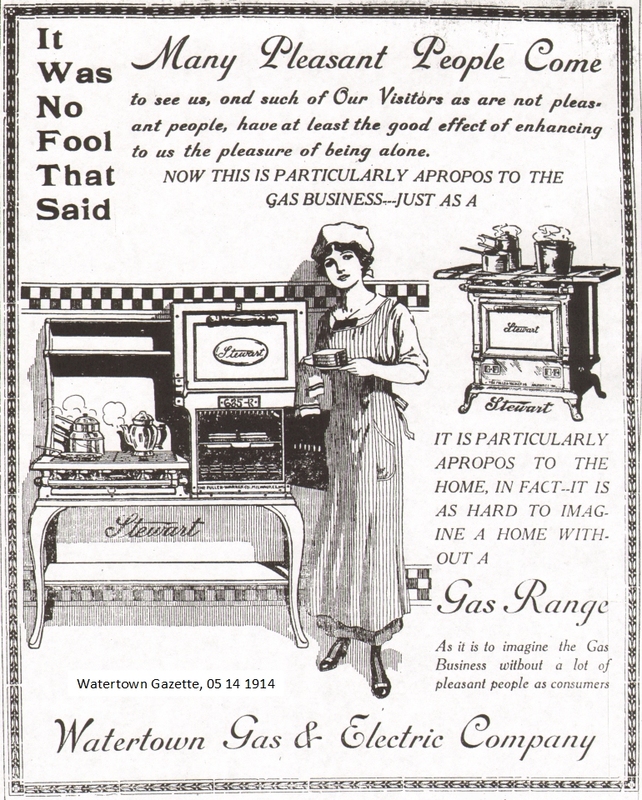 In the near future, possibly sometime in April, practical demonstration of the use of gas for fuel and cooking purposes will be made in this city and the use of gas generally advocated and its many advantages shown in a practical way at Concordia opera house under the direction of a competent person, who will remain here two weeks. 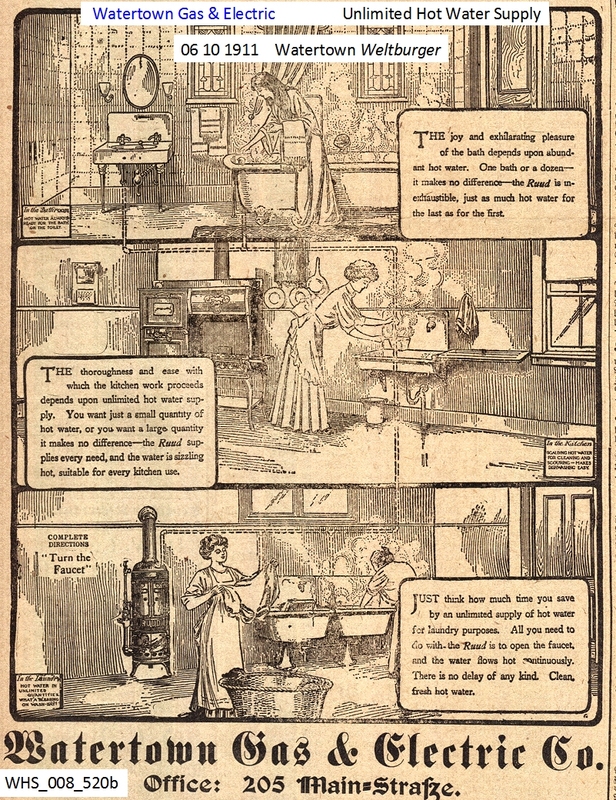 The use of gas for cooking will receive special consideration by practically showing what can be done with a gas range. 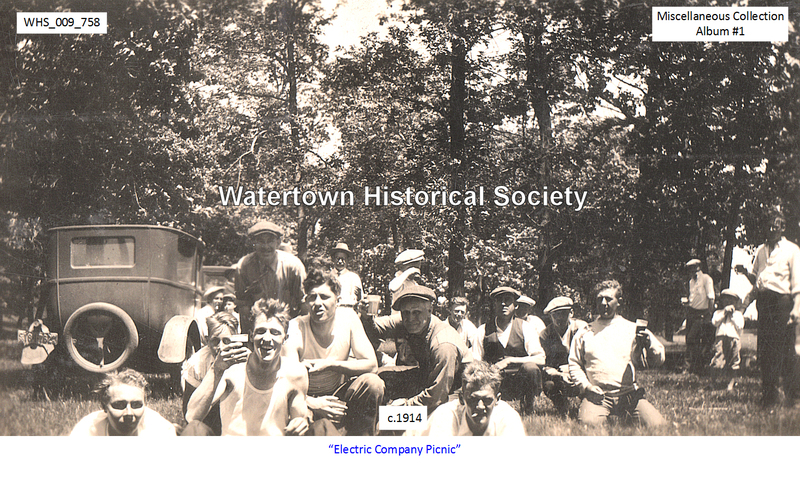 Frank Boelter, who resided in North Montgomery Street, was killed in the power house of the Watertown Electric Co. at the Rough and Ready Dam. Boelter was employed by the company as a laborer, and with a number of other men had been at work at the power house putting in position a governor for the water wheels. Common Council: Resolved, That the Watertown Electric Company keep burning the electric arc lamp now placed in front of the Turner hall the same nights and length of time that the other city electric arc lamps burn throughout the year, and that said company be paid for so doing twelve dollars ($12.00) per year in addition to the money paid for street lights annually. 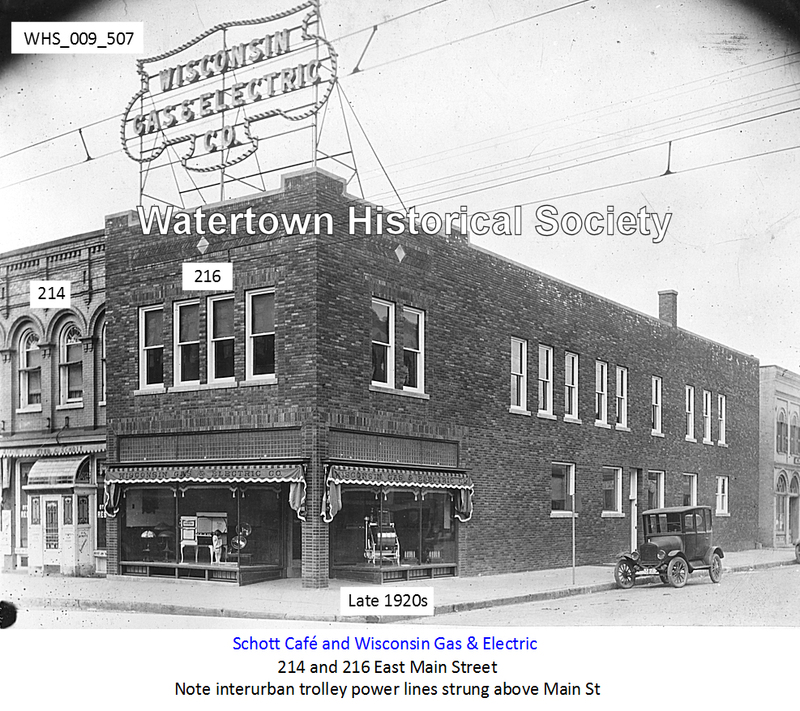 Resolved, That Welsbach gas lamps be placed in the streets of the city of Watertown, Wisconsin, at the following designated points, to wit: [here follows 55 different intersections at which the lights will be placed]. The new arc electric lights burned all night for the first time Saturday under the new contract with the city. The power at present is furnished from the Rough & Ready dam for both arc and incandescent lights and this power will be utilized during several of the spring months. A new governor to control the lights when a heavy load is on will be put in which will make the incandescent lights more steady than at present. New machinery will also be placed in the power house on First Street to be used when the water supply is short. People who have occasion to be up during the hours after midnight until dawn appreciate the new lighting system. [same date] Live Wire A small chip of wood and a live electric light wire coming in contact Wednesday evening caused the shutting down of the east side electric lights for a short time about 8 o’clock. A small boy noticed a blaze over the door of Mayor Brusenbach’s saloon on Main Street and notified the proprietor who in turn notified the company. The electric current was turned off later on. When the repairer arrived it was readily seen what the matter was but thinking that perhaps the iron roof or cornice might have become charged with the current it was decided to turn off the lights. When that was done investigation showed that a small piece of wood, used for decoration purposes was underneath the wire and the wind in swaying the latter had rubbed off the insulation and the live wire coming in contact set the wood on fire. There was no damage to the building. 08 10 P. L. Utley and Charles Mackay of the Gas and Electric Company were in Milwaukee Monday. The object of their visit was to ascertain the cost necessary for the enlargement of the gas plant and the time it would probably require. The demand on the company for gas has increased to such an extent that the plant must be increased to meet the demand which now nearly exceeds its capacity. Should the plant be increased in size, the work will be begun at an early day. 09 13 A special meeting of the stockholders of the Gas and Electric Co. was held Tuesday evening to arrange for the enlargement of the gas plant, the demand for gas for cooking purposes as well as light having increased to such an extent as to make it absolutely necessary in order to meet the demand. C. A. Comstock has resigned as manager of the Watertown Gas and Electric Co., a position which he has very creditably filled for the past six years, and under whose management the business of the company has been greatly increased. He always took an active interest in city affairs and served a term as president of the Twilight Club. Mr. Comstock has several places in view and may decide to locate in one of the larger cities of the state. His successor in Watertown is Arnold C. Reutler, who has been in the local office of the company since 1906, starting at the lower round of the ladder as meter reader, then billing clerk, ledger clerk, complaint clerk, cashier, assistant bookkeeper, bookkeeper and chief clerk, and now to the highest position of the company in this city, that of manager. His promotion is certainly deserved. He has always been attentive to the duties assigned to him, courteous and efficient, and besides has the very best of habits, which go a long way in aiding a man’s advancement in life. Profile of Frank J. Boehm of the Wisconsin Gas & Electric Co, an associated company of The Milwaukee Electric Railway and Light Co, owner of Watertown gas works. William T Jones, retired as plant superintendent of Watertown Gas plant. Employed for over 30 years. When E. T. Hornickle, 211 College Avenue, closed his desk in the Gas and Electric building at Main and North Third Streets today he not only called it a day, he called it quits. 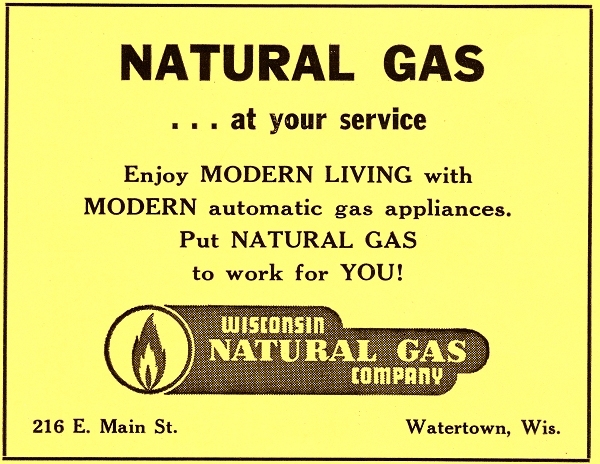 For today marked the end of his working days as Watertown district manager of the Wisconsin Electric Power Co. and the Wisconsin Natural Gas Co. For Mr. Hornickle it marks the end of a little over 38 years with the companies. He chalked up 38 years on June 15. It was announced some time ago that his retirement would become effective July 1. 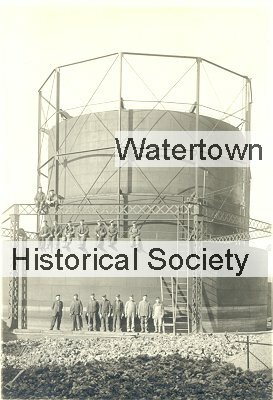 The huge gas storage tank on the site of the old Watertown City Gas Co. is coming down. No longer used, since the advent of piped-in natural gas, the Wisconsin Natural Gas Co. which now serves this area, ordered the tank removed and Loeb Salvage, Inc., Watertown is in charge. 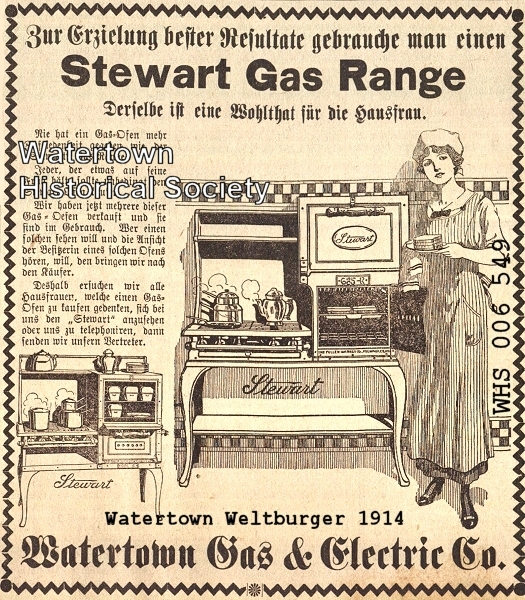 Watertown had its first gas service in 1856 when, on May 18 of that year, the Watertown City Gas Co. began service to a list of 100 customers. 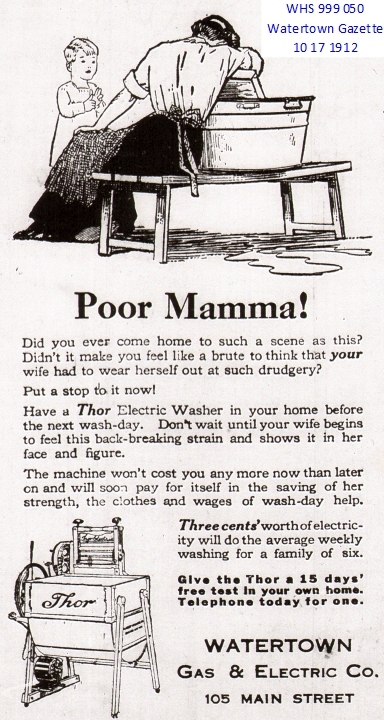 By 1903 there were 900 customers. 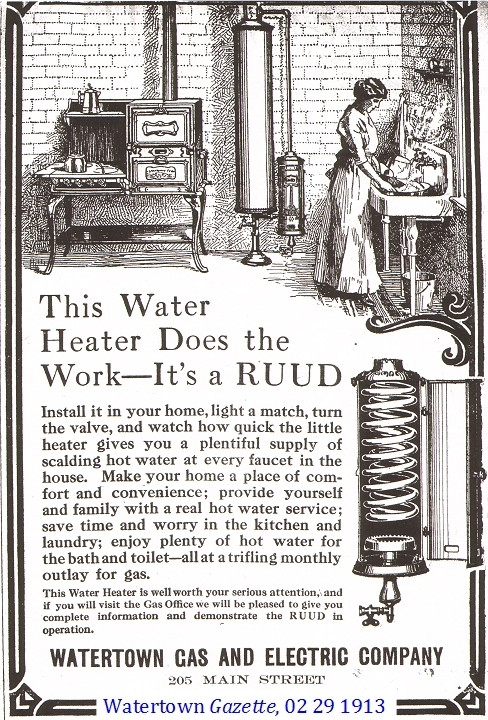 The first gas was used for illumination only and the first gas stoves were sold and installed here in the 1880s. 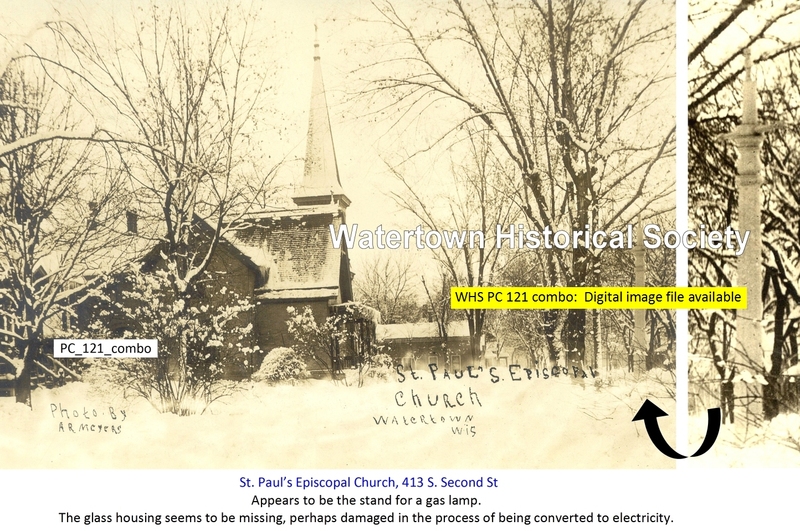 The 100th anniversary of electricity in Watertown will be celebrated as part of Watertown’s Old Fashioned Christmas festivities on Sunday, Dec. 3. Electricity first came to the city on Dec. 2, 1889 when the electric lights lit up the downtown area for the first time. Prior to that, illumination was provided by gas lamps. To commemorate the occasion, the city’s street lights will not be lit downtown on Dec. 3 until after the annual lighting ceremony of the municipal tree on the Rock River Walkway at 5 p.m. The lighted window displays in downtown stores will provide the only illumination until after the ceremony. In honor of the anniversary, the Wisconsin Electric Power Co. will give away three wall-mounted outdoor lights similar in design to the lights installed on poles along the walkway. Each of the 35-watt sodium high pressure efficiency lights has a value of about $240. Wisconsin Electric Power Company plans to move its customer center from its longtime Main Street location to the building currently housing the Sears catalog sales outlet. According to Jackie Hartmann, Rock River region manager for Wisconsin Electric, the utility will move into its new office at 111 N. First St. after renovations are completed by late summer. 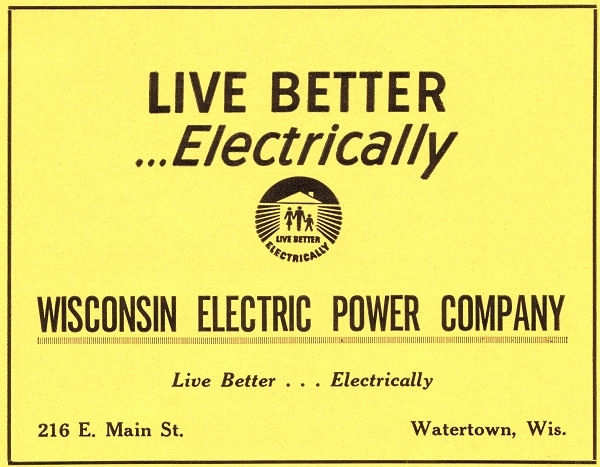 Wisconsin Electric has operated from its present location at 216 E. Main St. since March 1, 1923. Prior to that, the utility’s Watertown office was located at 205 E. Main St. Hartmann said the move is designed to provide better customer service at reduced operating costs. She noted that the office, which handles customer service for Wisconsin Electric and Wisconsin Natural Gas Company, will continue to have a downtown location. Ray’s Shoes is undertaking a major renovation and expansion of its flagship retail store in downtown Watertown. Dan Beltz, president of the firm, said the Wisconsin Electric Power Company building at Third and Main streets has been acquired and is in the process of being renovated for expansion of the shoe store which is located immediately to the west. Initial stages of the project have started. The common wall between the two buildings has been removed. When the new section is opened, Beltz said the entire retail store will be redecorated under the direction of his wife, Kristin Laramie Beltz. After a couple years of negotiations, the city has purchased the We Energies property south of the street department building on South Second Street, according to Mayor Ron Krueger. The city closed on the purchase of the 1.5-acre parcel Tuesday at 2 p.m., Krueger said. He added the city bought the land for $48,000. The city is planning on using the property for street department employee parking and to house a salt shed. City officials have been trying to obtain the land ever since it was decided that the current street department site would be used for the new public works facility, which was about two years ago. Gas and Electric Co building, 216 E Main. Earlier was site of Gahlmann’s Deutsches Dorf. For about 30 years past he was a member of the brick manufacturing firm of L. H. Cordes & Co. In 1889 he was one of a company of three who put in the electric lighting system in our city and the company later disposed of the plant. 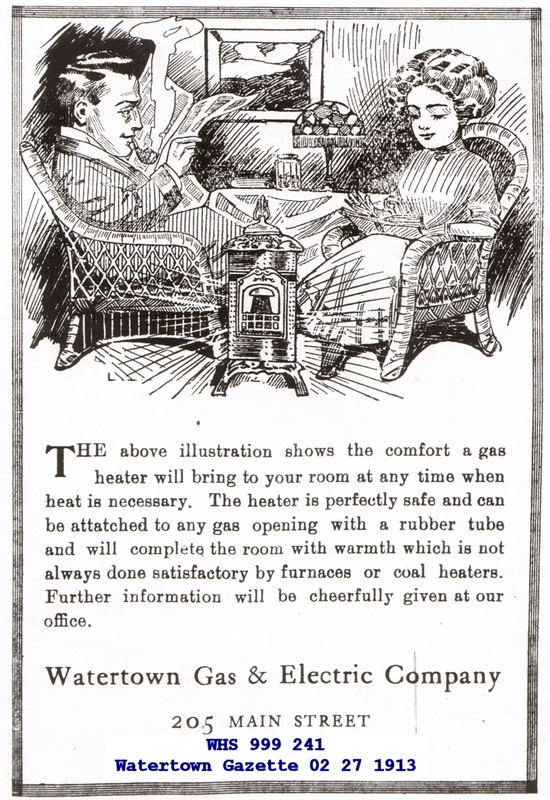 J. H. Sleeper, 1939-1888, was president of Watertown Gas Co.